Jeff and I are trying to spend at least some time every Tuesday shopping/selecting items for our remodel. It spreads out the task and makes it much more pleasant. Right now, we don't have any deadlines looming which force us to make a choice quickly so we can carefully consider our options. Today we went and looked at stone slabs; first at Intrepid Marble & Granite then Pental Granite & Marble. Today, we specifically went to look at Soapstone and Empress Green Marble. Neither businesses had/seemed to carry the marble anymore, despite it being shown on their website. (Bummer; that was my favorite when we remodeled our Forest Grove house. ) As for the soapstone, I understand it was among the options people used in the early 1900s. It was not common by any means, but at least it was available and may have been used. Intrepid had a couple of nice slabs. They didn't picture very well, unfortunately. The slabs are shiny because they mist them down with water to imitate the effect of oiling and so you can see the grain pattern. Pental only had one interesting slab but they did give us some pieces of soapstone to take home with us. We're looking forward to playing with them. 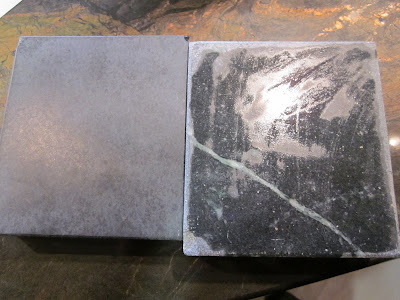 My one fear of selecting soapstone is it will be too dark in our fairly small kitchen. We also looked at an "antiqued" granite that was quite nice and would likely blend well with some butcher block countertop. The slab looks washed-out in the large picture; the correct color is in the small photo. It's going to be a pretty tough decision. Wish We Could Keep Them!